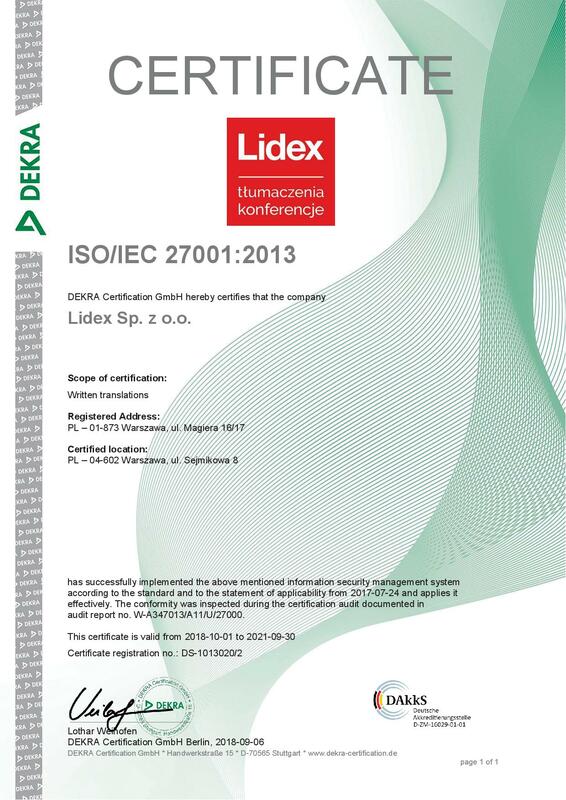 The Customers of LIDEX can take advantage of an offer unmatched by any other company in the Polish market: a combination of 30 years of tradition and state-of-the-art services, coupled with superior quality of services (owing to the implemented Quality Management System and the ISO certificates obtained), and a guarantee of security with respect to Customer data and contacts at every stage of doing business with our Company. The security authentication referred to above as well as the information security certificates held by LIDEX constitute an external confirmation of the guarantee in question. 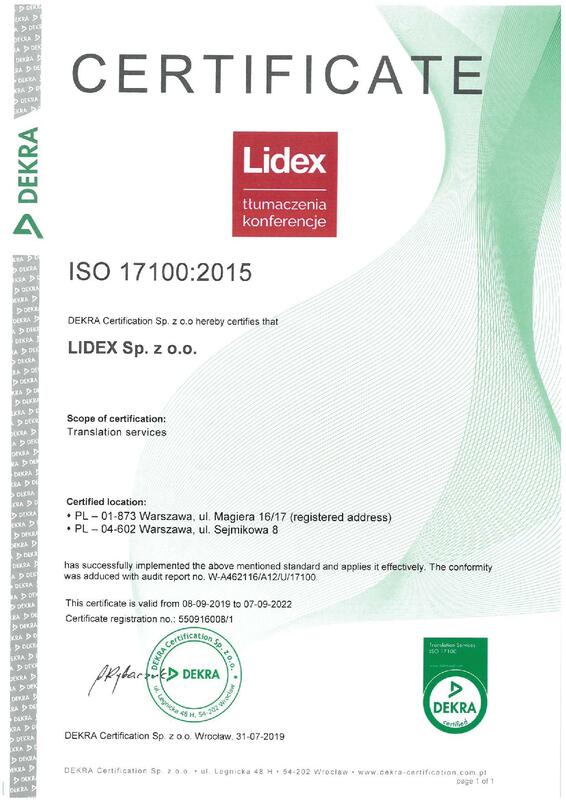 Based on the feedback provided by our Customers, including, in particular, government institutions and companies operating in the financial, medical, pharmaceutical, banking and insurance sectors, we can confirm that this security guarantee with respect to their interests is one of the decisive factors which encourage them to choose LIDEX. THE ISO 9001 QUALITY CERTIFICATE are the evidence for our Customers that we provide top quality conference services. LIDEX stands for the superior quality of conference services: interpreting, technical support of conferences, technical condition of equipment and, most importantly, the competences and practical experience of our technical personnel. THE ISO 27001 INFORMATION SECURITY CERTIFICATE For all our customers – companies and institutions – our certificate No. 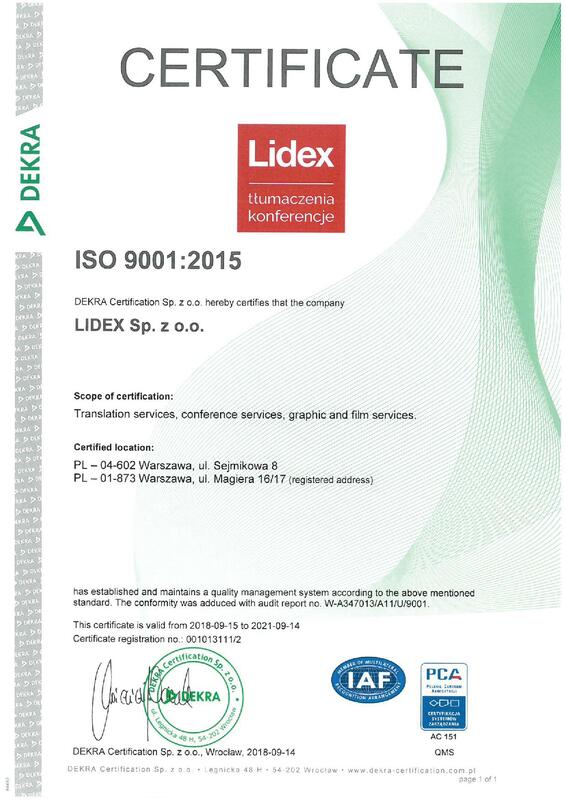 DS-101302 is the proof that LIDEX has the requisite infrastructure, procedures and well-trained personnel, and is therefore able to guarantee the absolute security of all information obtained from its customers. THIRD CLASS INDUSTRIAL SECURITY CERTIFICATES issued by the Internal Security Agency (ABW) serve as testimony to the capacity of LIDEX to ensure the protection of information designated as “secret”, “NATO SECRET” and “EU SECRET” when working with various organisation – whether domestic or international – including entities originating from EU and NATO Member States.